I'm pee-my-pants excited about today's giveaway from Freshly Picked! in any choice of color and size! in infant/toddler sizes 1 through 10. The cherry on top is that all Freshly Picked moccasins are made right here in the good ol' US of A. So who's the brainiac behind FP? It's Susan and you may have recently seen this pretty lady a few weeks ago on Shark Tank!! This mama started her biz in 2009 from her kitchen table with limited funds and today her shoes are considered the royals of all royals when it comes to kid's moccasins (even the Kardashian's kids own a pair)! This right here makes my heart skip a beat. I mean seriously look at all that mocc yumminess! To shop these high-quality, unique, and stylish shoes you can visit the Freshly Picked shop here. To win a pair of your own Freshly Picked moccasins please enter via Rafflecopter below by 2/23/2014 for your chance to win! There were technical difficulties in submitting manual entries (from Instagram) into Rafflecopter and after going back and forth with their IT support with no luck in fixing the issue I had to end up using Random.org to select my winner. Radiant Orchid are to die for. I would pick Blush for my new little granddaughter! I like Weathered Brown, Ox Blood, Red Rock Suede, and so many more. Oh my goodness I want them all! Drooling, drooling, drooling! I want the blush moccs (among others) so bad. I love the steel color! What an awesome giveaway! Best giveaway ever! I would pick platinum it my favorite!!!! I would definitely do "swimmin with the sharks" moccs! 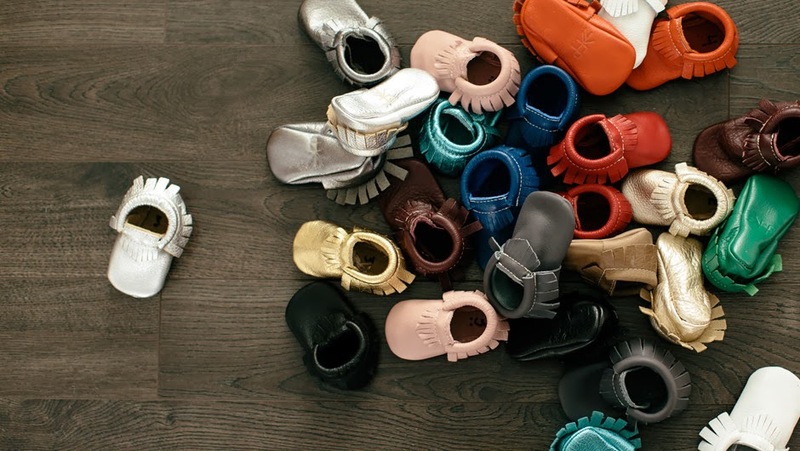 twins due in July, these moccs would be a fabulous addition to our wardrobe! I love the gold moccs! Blush is just perfect for a precious little girl. Love 'em! Oooooo I would love love to win!! Such A GREAT giveaway!! I think I would pick the gray! Metallic pink i would love to get my very first pair of moccs I've heard a lot of fp this is am amazing giveaway. I would love the red oness!! This would be so awesome to win!! thanks for the chance to do so! I'd pick the gold moccasins! If I won I would choose the Steel moccasins! I would get the Weathered Brown - Moccasins for my nephew! Elena G. - I saw these on Shark Tank! I would love to win a pair of the Blush moccasins for my baby girl. I would pick the cherry red....it'll definitely pop in any outfit...plus it's such a fierce color..it screams fighter to me when I see red like my 1 year old cancer survivor who beat stage 4 neuroblastoma 3 weeks ago... i would say the rich purple suede moccs to represent neuroblastoma or Gold moccs because it represents childhood cancer. Platinum, steel or iced mint. I can't decide. Can I have them all? Chocolate or pink froat would be my first choices! I really <3 this giveaway. I would sincerely appreciate the Sand Suede moccasins for my May baby if I were to win! The Chrome ones are adorbs!! I'm loving the Radiant Orchid! I like the Prince George ones. I would choose the Grass Suede. Those are so cute. I would love the yellow or platinum! I would love the platinum or radiant orchid! prince george, ebony and cherry are at the top of my faves!! swoon! I've wanted the ox blood for so long now. But really how do you choose one?! Weathered brown & Prince George are also high contenders. I love the weathered brown moccs! I would love the Gold pair!! Thanks for the chance! I love the platinum my daughter currently has... and would love the next size up so she can continue to wear them. Also blush! Love freshly picked moccs! My boys wear all the time and they are absolutely the best! Thanks for the chance to win another pair! I love the Gold, platinum, turquoise, all of them are adorable!!! If I won ebony please! Weathered brown, swimming with sharks or ebony!! Love us some moccs on little toes!! I love the blush pink moccs! Beauties. I love fp moccasins. They are my favorite because they are super cute and comfortable on my baby's feet. I like all colors but I would choose cooper or steel. I would pick the chocolate moccs. I love the steel! I think they would go with many different outfits! I want the Iced Mint moccasins.